Life's Journey To Perfection: Mommy Monday - My Gospel Standards FHE wk 3: I will choose the right. I know I can repent when I make a mistake. Family Home Evening Outline for: I Will Choose The Right. I Know I Can Repent When I Make A Mistake. Scripture: Moroni 7: 16-17 "16. For behold, the Spirit of Christ is given to every man, that he may know good from evil; wherefore, I show unto you the way to judge; for every thing which inviteth to do good, and to persuade to believe in Christ, is sent forth by the power and gift of Christ; wherefore ye may know with a perfect knowledge it is of God. 17. But whatsoever thing persuadeth men to do evil, and believe not in Christ, and deny him, and serve not God, then ye may know with a perfect knowledge it is of the devil; for after this manner doth the devil work, for he persuadeth no man to do good, no, not one; neither do his angels; neither do they who subject themselves unto him." Our Heavenly Father wants us to choose the right and keep his commandments, he knows that that is the only way we can return and live with him someday. So he has given us the Holy Ghost to help us to make the right choices. He has given us the scriptures to help us to know what path to follow. He has given us loving parents, leaders and good friends to help us a long the way. But he also knows that we are not perfect, that we are going to make mistakes a long the way. So he has given us an amazing gift! He sent his son Jesus Christ to earth to suffer for every mistake or sin that we make and for every pain we feel. He did this so we can repent for the wrong things that we do. So when we make a mistake we can follow the steps of repentance. 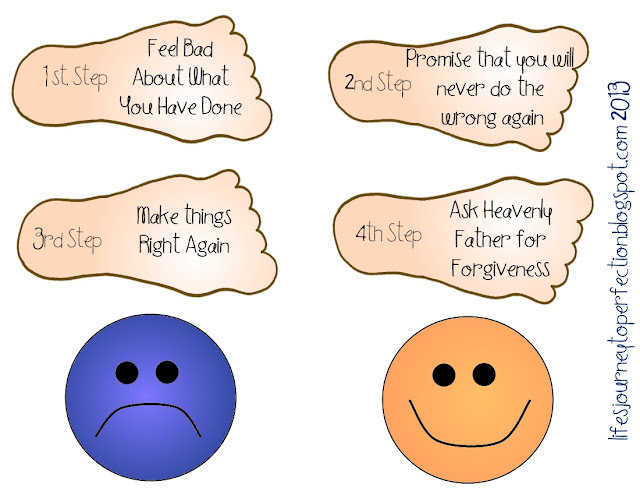 (Use the Repentance Steps printable here) Show the sad face and explain when we do something wrong then we are not happy, we feel sad. We want that sad unhappy feeling to go away so we need to take some steps to get rid of the wrong choice. First, we have to feel sorry for the thing we have done. Second, we need to make a commitment that we will not do it ever again. Third, we need to "Right the Wrong", which means we need to say sorry to the people we have offended. If something was stolen or broken then we need to replace the item. If it is a serious sin then we need to also talk to the Bishop. Fourth, we need ask for forgiveness from our Heavenly Father. We need to pray to him and tell him what we have done wrong and ask him to forgive us of that sin. Then, we need to promise him that we will never do it again. If we take these steps then we can feel happy again. The sin will no longer weigh us down. Show the Happy Face. Bear testimony of choosing the right and repentance.